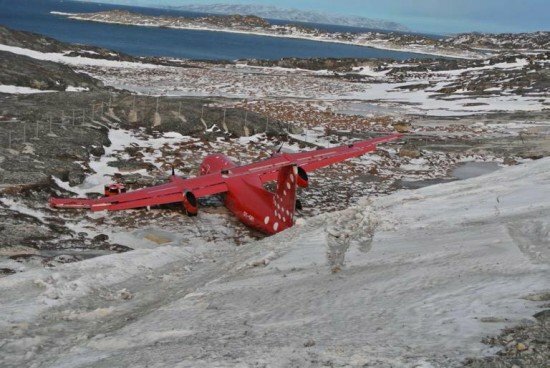 The failure of a DHC-8 main undercarriage leg was caused by the shearing of the landing gear fuse pin due to overload stress on landing in Greenland, according to preliminary investigation results. The AIB Denmark published a preliminary report of the investigation into an accident involving a DHC-8-202Q on January 29, 2014. Air Greenland flight GL-3205 originated in Kangerlussuaq, Greenland and was bound for Ilulissat Airport. On initial radio contact with Ilulissat AFIS, the flight crew got the information that runway 07 was in use. Weather information showed wind from 150° magnetic at 24 knots, maximum 33 knots, minimum 17 knots; a 24 knots cross wind, and a headwind of 5 knots. The wind at threshold runway 25 was gusting to 41 knots. Visibility was fine (10 km)with broken clouds at 12000 feet. The flight crew asked Ilulissat AFIS for a confirmation of whether or not the cross winds of 24 knots included the gusting wind conditions up to maximum 33 knots. Ilulissat AFIS replied that the maximum wind was 35 knots and the cross wind was 26 knots. On a 5 miles final to runway 07, the wind conditions were reported to be 140° magnetic at 28 knots with a maximum of 35 knots and a cross wind of 26 knots. On short final to runway 07, the wind conditions were reported to 140° magnetic and 25 knots, maximum to 39 knots. Upon touchdown on runway 07, the left main landing gear collapsed when the fuse pin sheared due to overload stress. With the left main landing collapsed and after approximately 104 meters of runway rolling, the flight crew started to loose aircraft directional control. After approximately 389 meters, the aircraft ran off the left side of the runway and into the safety zone. The aircraft skidded sideways, hit the Precision Approach Path Indicator (PAPI) to runway 25, skidded down a steep slope and impacted a rocky area approximately 10 meters below the runway elevation.